The Wineinger-Davis Ranch is located on the eastern plains of Colorado, and over the last 70 years has grown from 400 acres to over 12,000. After finishing college, Russell returned to the ranch where he grew up to run the day-to-day operations on the ranch with the help of his brothers. The ranch currently runs 500 black and red angus mother cows, 40 Angus bulls, and 400 yearlings. The ranch has a variety of habitats including short grass prairie, cottonwood/willow riparian corridor, playas, and sand sagebrush, and hosts associated species suites including, but not limited to, mountain plover, swift fox, black-tailed prairie dogs, burrowing owls, plains leopard frog, long-billed curlews, american avocets, and massasauga rattlesnakes. The ranch actively considers these species in its cattle management decisions. Russell drives the conservation efforts of the Wineinger-Davis Ranch and is a strong advocate for such efforts in the surrounding ranching communities. 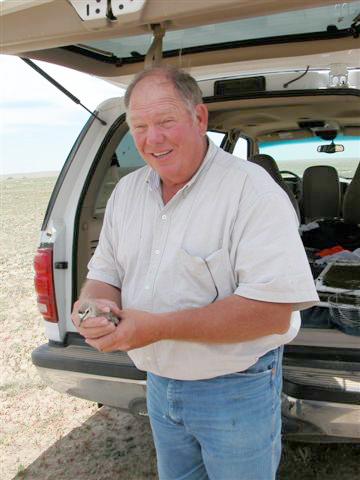 In addition to the easements and partnerships he actively manages on his ranch, Russell hosts the Karval Plover Festival and the Ranching and Wildlife Youth Program each year.